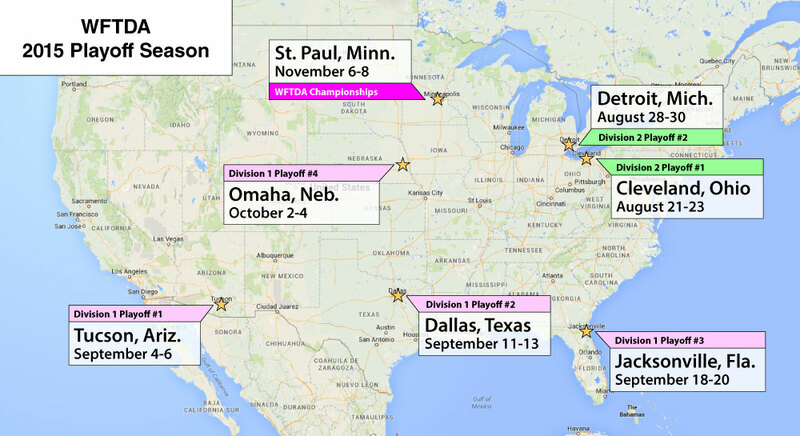 The WFTDA postseason kicks off on August 21. Between now and then, a few teams have some extra motivation to move up the rankings. The Minnesota Rollergirls have been selected to host the 2015 WFTDA Championships, in St. Paul, Minn., the WFTDA has announced. The championship tournament will take place November 6-8 after 60 WFTDA teams in two divisions do battle over six play-in tournaments, to take place this year from late August to early October. The festivities will start in Cleveland when Burning River hosts the first Division 2 playoff on August 21, followed one week later by the other D2 tourney in nearby Detroit. At only 90 miles apart, this is as close as two WFTDA tournaments have ever been to one another within the same playoff year. And these are on consecutive weekends! The first set of top 40 teams hit the track in dusty Tucson, Ariz at the first Division 1 playoff tournament, to be held on the first weekend of September. The WFTDA playoff circus will continue east through Dallas (Sept. 11-13) and Jacksonville (Sept 18-20) before taking a weekend off. The last divisional playoff will land in Nebraska on October 2, with hosts Omaha Rollergirls overseeing who can get the last invites to Champs. Teams looking to make a playoff run are not assigned to a playoff site until the rankings are locked-in and participants are confirmed. Normally, this means that no one knows who will play where until two months beforehand, which can cause some difficulty. This year, however, some of the potential guesswork will be taken out of it for a few leagues due to tournament locations and their host leagues. Division 2 teams will know that they will be headed for Lake Erie no matter what, allowing them to have a definite target in mind when it comes to having the budget to get there, even if they don’t know exactly where “there” will be until the invites are sent. That’s one bit of good news for hopeful D2 playoff teams, but three in particular will have some extra motivation to do well during the 2015 WFTDA regular season. But! If they can improve their play and make the jump up to the top 40, they too will host their own playoff tournament, play in front of their home fans, and save a ton of money by not spending thousands on travel costs to a Great Lake. That’s a hell of an incentive for them to do well this year, which will be worth keeping an eye on. Of course, the Minnesota Rollergirls will also have an incentive to play in their own tournament—that tournament being WFTDA Championships, where the 12 best WFTDA-derby teams from around the world will play for for the Hydra. Minny hasn’t played self-host since Brawl of America in 2009, back when there were still regional tournaments with punny derby names. As 2014 finalist and a current top 10 team, they’re in a good position to make that happen again. Which would be nice! The full playoff schedule is below … and is subject to change, if last year’s playoff schedule change-up reminds. August 28-30 – Detroit, Mich.
September 4-6 – Tucson, Ariz.
September 18-20 – Jacksonville, Fla.
October 2-4 – Omaha, Neb. Last year, the lowest-ranked team to make the D2 playoffs was #64 Grand Raggidy, after four teams above them declined or were otherwise ineligible to participate.